The Batts family has arrived at a hotel in Los Angeles and everything is all set for Aunt Laura’s wedding weekend. Stella and Penny are going to be getting a new uncle, and a new cousin! Plus, they get to be flower girls, and wear fancy dresses, and walk down the aisle throwing rose petals. It’s going to be perfect--just the way Aunt Laura has imagined it. Just the way Stella has imagined it, too. But sometimes a wedding doesn’t happen the way anyone thinks it will--including the bride. Things are starting to go wrong, and Stella is worried that it’s all her fault! 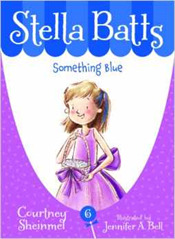 Stella Batts is one of our favorite book series for nieces - and nephews! Author Courtney Sheinmel is a Savvy Auntie, herself. And Something Blue is all about a Savvy Auntie and her niece! How fAuntastic. For more on Stella Batts Something Blue, read our interview with author, Courtney Sheinmel here.